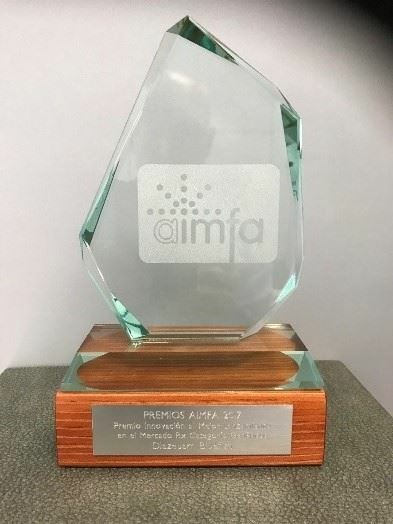 The Grouping of Investigation and Pharmaceutical Marketing (AIMFA), has recognised Bluefish Pharmaceuticals for the most sucessful Generic launch in 2017. Pedro Costa, Bluefish South Europe Regional Manager, and Kim Kjornas, VP for Marketing & Sales, were in Toledo in Spain where the 29th Annual Meeting was held and pharmaceutical companies were awarded prizes in different categories. Bluefish was awarded the prize for the best launch of Generic drug, Diazepam, in 2017 in Spain. We are proud to say that Bluefish Pharmaceuticals was as one of the few award-winning generics companies.